Overview - Ewan McGregor (Beginners) and Emily Blunt (The Adjustment Bureau) star alongside Oscarc-nominee Kristin Scott Thomas (I've Loved You So Long) and Amr Waked (Syriana) in this extraordinary, beguiling tale of fly-fishing and political spinning, of unexpected heroism and late-blooming love and of an attempt to prove the impossible, possible. Directed by Oscarc-nominee Lasse Hallstr”m (Chocolat) and written by Oscarc-winner Simon Beaufoy (Slumdog Millionaire), this feature film is based on Paul Torday's acclaimed novel about a scientist who looks to fulfills a sheikh's dream of bringing the sport of fly-fishing to his homeland in Yemen. It is produced by Paul Webster (The Motorcycle Diaries) and executive produced by Jamie Laurenson, Stephen Garrett, Paula Jalfon, Zygi Kamasa and Guy Avshalom. In life, sometimes it's important to try new things, to grow as human beings, to attempt the impossible, to head upstream and swim against the current. You know, like a salmon. At least, that's what the characters in 'Salmon Fishing in the Yemen' learn -- which, not so coincidentally, happens to feature lots of salmon. Lot and lots of salmon. A charming, sweet little romantic dramedy, the film is home to a wonderful cast and a fun, quirky script. While the plot does adhere to a few clichéd dramatic beats, the story's upbeat spirit and clever humor are irresistible. The destination may be a bit predicable, but the journey proves to be heartfelt and entertaining. Based on Paul Torday's novel of the same name, the movie follows a Sheikh's efforts to bring salmon fishing to the Yemen -- an area seemingly ill-suited for such a sport. The Sheikh's tenacious consultant, Harriet (Emily Blunt), is tasked with the impossible assignment, and soon reaches out to a fisheries expert, Dr. Fred Jones (Ewan McGregor). At first baffled by the ridiculous notion, Jones declares the plan "fundamentally unfeasible" and wants nothing to do with it. Meanwhile, in search of a good PR opportunity, the Prime Minister's press secretary (Kristin Scott Thomas) latches onto the project, and pledges the British government's support. Now strong-armed into aiding their efforts, Jones slowly opens up to the idea. As the practical scientist begins to believe that the impossible might actually be possible, he simultaneously develops feelings for Harriet. Unfortunately, outside forces arise, not only threatening their budding relationship, but the project itself, potentially spelling doom for Jones and the Sheikh's elaborate dreams. The script carries a fun, charming sense of humor, lifting us through a breezy, but thankfully not superficial adventure. Watching the leads attempt to achieve the impossible for the sheer thrill and magic of it all is fun and inspiring. Themes dealing with growth, spirituality, and faith are all touched upon, and the filmmakers' good-natured approach manages to be positive and uplifting without becoming saccharine or preachy. The salmon's impossible journey becomes a metaphor for Jones' own character arc, and both storylines end up fueling most of the narrative's momentum. It might not be the deepest of allegories, but the simple parallel works very well, and the pragmatic man's potential transformation into a genuine dreamer is compelling and humorous. Quick witted, fast-paced dialogue is prevalent throughout the runtime, and characters will often speak in cheeky formalities, displaying a very British sense of playful humor. As lighthearted as the picture can get, there is some genuine drama as well, and director Lasse Hallstrom does a great job of balancing the tone. Hallstrom also throws in a few fun visual touches every now and then (text from emails will appear on screen, for instance), but mostly offers a simple cinematic style that lets the whimsical story speak for itself. Chemistry is paramount when it comes to films of this type, and Ewan McGregor and Emily Blunt absolutely sparkle. McGregor's Fred is a typical wet blanket scientist who is all business and totally out of touch with his emotions. Conversely, Blunt's Harriet offers a warmer, more adventurous presence, and as soon as the characters meet, it's instantly clear that they've found their match. Both performers are incredibly likeable and their playful verbal sparring has a certain screwball charm that's infectious. Kristin Scott Thomas is also quite funny as the constantly scheming Patricia Maxwell, and Amr Waked lends Sheikh Muhammad a dignified air of wisdom and compassion. As wonderful as McGregor and Blunt are on-screen together, the plot is victim to certain standard romantic comedy contrivances. Disappointingly typical obstacles work to keep the couple apart, and the story remains fairly predictable throughout. An existing boyfriend and wife add some necessary conflict, but the script hits very tried-and-true notes with their subplots. Also, while the emphasis on human drama is much appreciated, the larger-than-life task that sets off the plot receives surprisingly little screen time as the movie heads toward its climax. Much talk is dedicated to planning the seemingly impossible mission, but when it comes time to actually implement it, the whole affair is oddly skimmed over and doesn't really seem all that difficult. Thankfully, this doesn't hurt the film much, and despite the occasionally familiar storytelling, the narrative is executed well. 'Salmon Fishing in the Yemen' is a simple but irresistibly fanciful film. Its sweet story is bolstered by great performances from the entire cast, and McGregor and Blunt make for a lovely on-screen couple. As original and quirky as the script can be, beneath the plot's outward imagination is a very standard romantic dramedy narrative. Though a few beats are a little contrived and predictable, the director's heartfelt sincerity and the script's witty humor save the picture from becoming too formulaic. It has some flaws, but there's just something about the movie's lighthearted spirit that manages to win you over in the end. 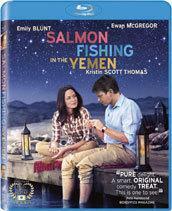 Sony brings 'Salmon Fishing in the Yemen' to Blu-ray on a BD-50 disc packaged in a keepcase. After some logos and warnings the disc transitions to a standard menu. A code for a redeemable UltraViolet digital copy is also included. The movie is provided with a 1080p/AVC MPEG-4 transfer in the 2.40:1 aspect ratio. Featuring a nice clean look and a few impressive shots peppered throughout, the film comes to Blu-ray with a handsome transfer free of any major issues. The print is in pristine condition, and a very light layer of unobtrusive grain is visible, giving the image a natural, filmic quality. Detail wavers a bit from scene to scene, with more dimly lit sequences carrying a comparatively soft look. Bright scenes, however, feature very nice clarity, revealing many sharp textures and fine details. Shots capturing the breathtaking Scottish Highlands and majestic Moroccan landscapes (substituting for Yemen) are particularly impressive, and offer a great sense of depth and pop. Colors are rich and nicely saturated, complementing the whimsical tone of the story without becoming unnatural. Contrast levels are high but avoid blooming, and while blacks are a little inconsistent, shadow detail remains solid. Certain scenes are less impressive than others, but the film's simple, colorful aesthetic looks quite nice in high definition. Free of any unnecessary digital manipulation or artifacts, the transfer remains authentic and very pleasing. The audio is presented in an English DTS-HD MA 5.1 track with optional English, English SDH, and Spanish subtitles. Though a bit front loaded, there are a few lively bursts that provide a decent sense of immersion during key moments. Dialogue is crisp, clear, and well prioritized throughout. The front soundstage has some solid separation and directionality with music and speech, but for the most part, discrete and disperse effects are minimal. Surrounds are fairly quiet during several stretches, but do perk up when appropriate with some ambient sounds like background traffic, rain, wind, or buzzing flies. These instances are quite subdued but do help to enhance the atmosphere and scope of the mix. Dynamic range is wide, providing a nice gamut of distortion free frequencies. The film's climax actually features some aggressive design work and there is even some solid bass activity. Though a tad on the small side, the soundfield suits the material well and the relatively limited effects never overpower the story. It's not as enveloping as one might hope, but given the dialogue heavy nature of the production, the mix is very solid. Sony has put together a slim and underwhelming set of supplements. All of the extras are presented in standard definition with Dolby Digital 2.0 audio and optional English subtitles. Miracles Happen: Making Salmon Fishing in the Yemen (SD, 13 min) - This is a basic promotional look at the film's production. We get some cast & crew interviews interspersed with behind-the-scenes footage as the participants discuss the movie's plot, themes, source material, locations, and characters. They are a few interesting morsels offered, but for the most part, this is a pretty fluffy and shallow featurette. The Fisherman in the Middle East: Novelist Paul Torday (SD, 3 min) - A very brief interview with the source novel's author is included. Torday discusses the book's path to the screen, but the piece is far too short to be of much interest. Lasse Hallstrom's 'Salmon Fishing in the Yemen' is a sweet, witty, inspirational romantic dramedy that features wonderful performances from the always likeable Ewan McGregor and Emily Blunt. The script does adhere to certain genre clichés and contrivances, but the heartfelt execution ends up elevating the material. The video transfer is very nice and the audio mix is solid. Unfortunately, the included featurettes are too brief and superficial to offer much value. Though flawed, the film has a fun, whimsical charm, and this disc is certainly worth a look.